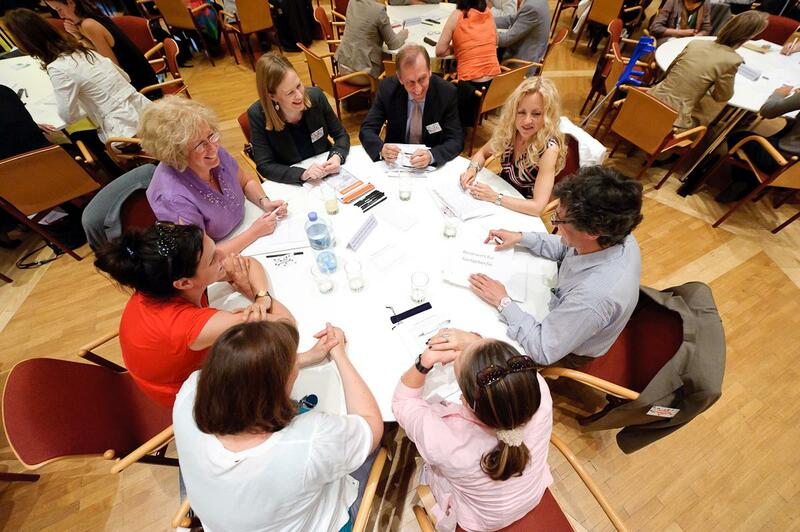 Prevention and health promotion are the central concerns of Fonds Gesundes Österreich (FGOe). Our work is guided by the holistic concept of health applied by the WHO. Health is a state of physical, mental and social wellbeing. This view also means that people’s health is determined by two factors: their individual behaviour and the circumstances in which they live. 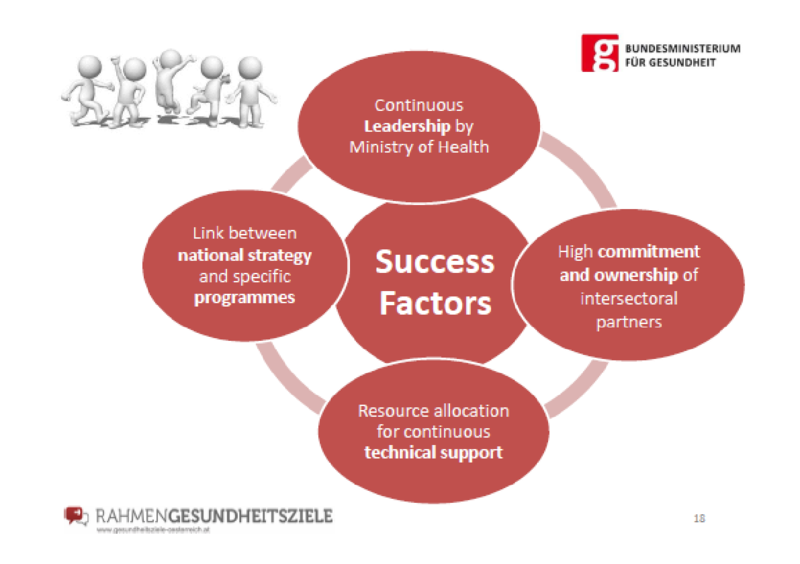 Our legal basis is the Health Promotion Law released in 1998, including sources of 7.25m Euro annually and since 2006 the Fonds Gesundes Österreich is part of the Austrian Public Health Institute. 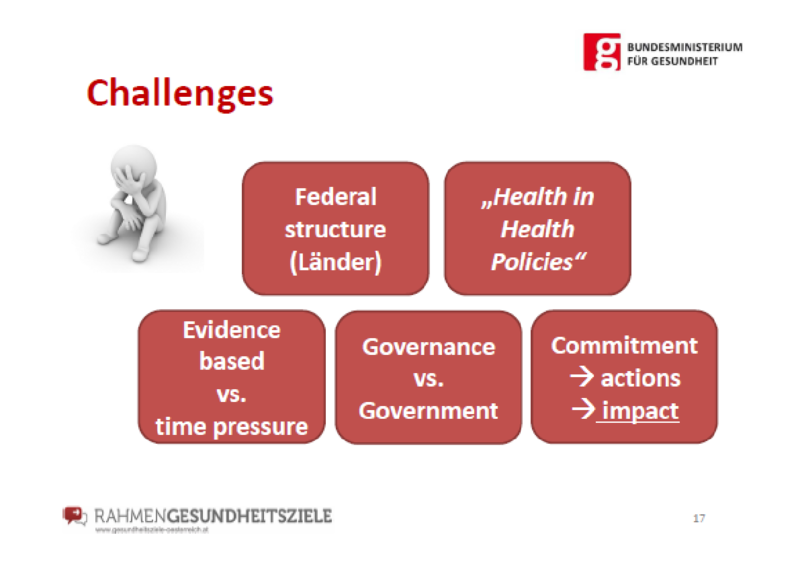 Our purpose is to build capacities for health promotion in Austria following the Ottawa Charter. We do this in different ways: One main task area is the initiation, funding and evaluation of health promotion projects in settings like schools, workplace or communities. Therefore we offer guidelines and support but we also try to assure the quality of the projects through high requirements to applications for support and appraisal. We have defined some principles of health promotion, which have to be implemented. These are e.g. health equity, orientation on determinants of health, participation or setting approach. In addition we offer education for professionals in health promotion and health information to the general public and services for self-help organisations. We also lobby for health promotion and we support the Austrian Health Promotion Strategy and the Austrian Health Target Process. Further information is available at www.fgoe.org (Austrian Health Promotion Foundation). 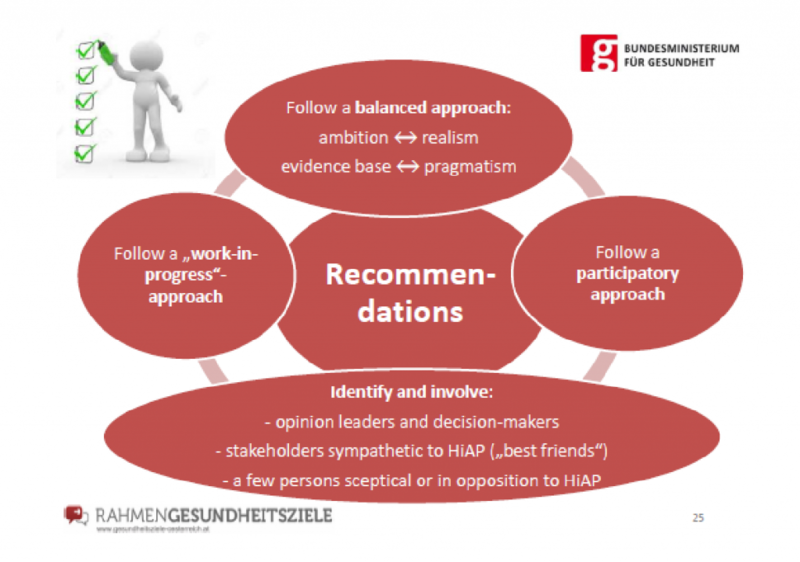 As Health in All Policies is an important aspect within health promotion (especially concerning health determinants and health equity) the Austrian Health Targets and especially the Health Target Process is highly relevant for health promotion in Austria. The Austrian Health Promotion Fund is involved in the process in different ways. 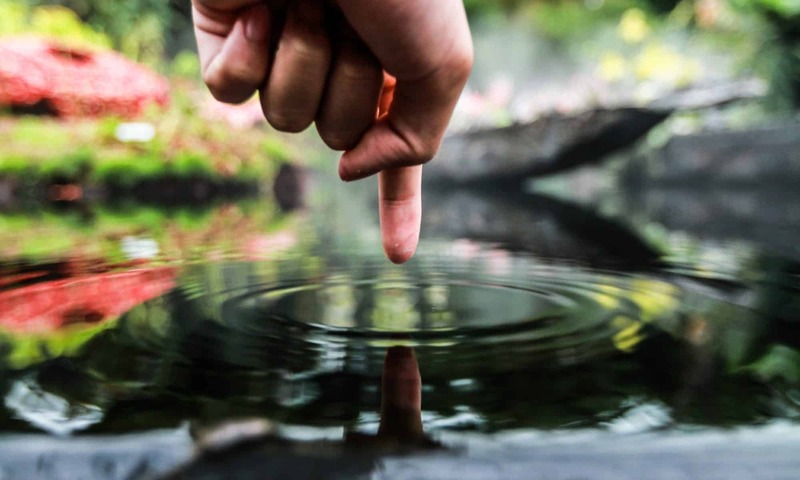 The Health Target Process was initiated by the Ministry of Health in 2011, commissioned by the Federal Commission for Health and the Council of Ministers in Austria and assisted by the Austrian Public Health Institute. Based on the recognition that health of the population is determined by living conditions and lifestyles, which are mainly influenced by factors outside the health sector, it was decided that a broad stakeholder engagement is of utmost importance. Around 40 national and regional institutions (the so called “plenum”) have been involved in developing the targets collectively. The “plenum” consists of representatives of 11 federal ministries, of provinces and municipalities, of social insurance institutions, of health professionals, social partners, patients and senior citizens organisations, youth organisations, NGOs and others. Since 2011 the plenum has met 2 to 3 times a year to guide the process. Broad participation of important policy and societal actors has been regarded as one of the key success factors of the process. . The targets are based on a number of guiding principles. 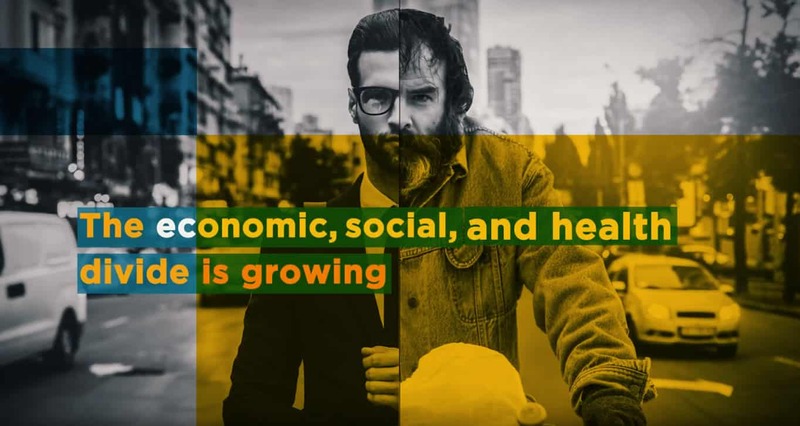 The most relevant are “focus on health determinants”, “health-in-all-policies approach” and “promoting health equity”. The importance of health equity and HIAP are central for the process since both represent not only a guiding principle, but are also highlighted through specific health targets, such as health target 1 and health target 2 (see frame). A broad governance approach is seen as central and necessary in order to generate joint ownership and to advance health in general. The challenge, however, is to communicate the win-win situation to different decision-makers and political players. Since 2012 intersectoral working groups for each target have met on several occasions throughout the year in order to formulate sub-targets, concrete actions and indicators, and to discuss the implementation of all measures. In addition the chairpersons of these intersectoral working groups have come together at least twice a year in order to exchange experiences and lessons learned, coordinate further steps in the process and enhance commitment. Each action/measure has a defined institution responsible for its implementation. When a concrete action is defined within the intersectoral working groups, it is crucial that the action is financially secured and funding is available. There is no joint budget for the process. Meanwhile packages of measures of 5 working groups are available and being implemented. The implementation is monitored by the Austrian Public Health Institute. Gudrun has worked for the Austrian Public Health Institute since 2010. She is a sociologist (University of Vienna) and principally involved in the area of health promotion, especially responsible for capacity building for health equity and health in all policies. 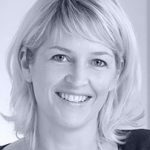 She is involved in the development of the Austrian Health Targets as well as in the Coordination Centre of the Austrian Platform Health Literacy. She is the head of the Task Force Socio-economic Determinants of Health and also responsible for the promotion of self-help groups and organisations.